Where most people look for pretty trees at the campground, we look for pretty cell towers! We travel all over the country in our Motorhome and we depend on our website, GeeksOnTour.com, for our living. Internet connections are very important to us and we rely on Verizon thru our Android phones to provide that connection. We also live-stream a smartphone educational show every week. It’s called What Does This Button Do? and we do it from our motorhome. In case you are not aware, “Streaming” and “Internet Hog” are synonymous! I have to be reminded that some people use their phones to make phone calls! Just to be clear, we’re only talking about Internet … Data … connections in this article. Voice is a different topic which may or may not be affected by the same factors. Most people judge their cellular Internet connection by simply looking at the signal bars on their phone. 1-2 bars = bad; 4-5 bars = good. But that’s not always true. Signal strength is only one measurement, and in my opinion it is not the most important one. We have been in places where we were seeing only 1-2 bars, yet our Internet performance – the speed – was very good. We have also seen 4-5 bars and had low speed. We use the Ookla Speed Test app to check our speeds. We’ve seen download speeds ranging from .2 Mbps to 74. But, those numbers don’t always correlate with the signal strength. In the image above you can see that the signal strength is not that great, yet the speed is VERY good! And, we’ve seen the results go the opposite way as well; where the signal strength has been registering 5 bars, yet the speed is <1Mbps. When we pull into an RV park now, we drive around with our cell phones out and Ookla Speed test running. At each possible site, we’ll do a speed test. We were recently at the Thousand Trails park in Hershey, PA and we planned to be there for #48 of our What Does This Button Do?, so we really needed good Internet. When we pulled into the park, our signal strength was registering only 2 bars … of 3G. Not good. There were some areas where we saw no signal at all. 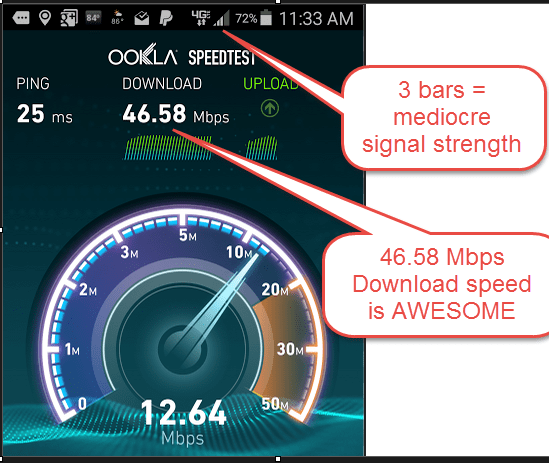 Then we found one area with 2 bars of 4G, so we started an Ookla speed test and saw less than 1Mbps of speed. We thought we would need to leave and find another park, but we kept looking at other sites and doing speed tests. We found one, where Ookla registered 2-3 Mbps both up and down, so we parked. Surprisingly, we were able to do our show just fine. Realize that the signal strength bars are simply measuring how strong the signal connection is between your device and the nearest cell tower for your service provider. So, there may be times when you are very close and have good signal strength, but it’s an old tower with outdated equipment. A better connection doesn’t help if what you’re connecting to isn’t any good. And vice versa – you may have a weak connection but if the cell tower you are connecting to has the latest and greatest technology, you may still get good results. Realize that “Old” and “Outdated” may be measured in months! Cellular technology is very fast-moving. If you want to learn more about this, we recommend the excellent book: RV Mobile Internet Handbook by Chris Dunphy and Cherie Ve Ard of Technomadia. You can find the book and much more on their website RVMobileInternet.com. You can’t just look at the numbers and know how good your Internet connection is. I thought we would be unable to do our streaming show from the Hershey campground based on the numbers, but it went just fine. There are so many factors in this complex technology. It’s your experience that counts. Browse to a website; did it load fast or are you still waiting? Try to play a YouTube video; does it start right away and continue straight thru or does it stop ever few seconds to buffer? Try uploading a video; does it complete or does it die halfway through? If you’re not getting the results you want, there are signal boosters that will help, but only IF the problem is signal strength. If the problem is cell tower equipment quality, you may need to move! Don’t go over your Internet Limits. 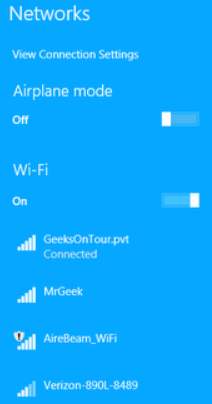 Windows 8.1 Wi-Fi Tools can help. Like water and electricity, Internet usage may be metered. Many travelers use their cellular devices as Wi-Fi hotspots. For example, we have smartphones with a Verizon Data Plan for Internet access. We turn a phone into a hotspot and connect our computers’ Wi-Fi to that hotspot. When the computer is working on the Internet, it is consuming Internet resources from our Verizon Data Plan. Many other people have a mobile hotspot called a MiFi or a Jetpack that their computers connect to. These are also powered by a cellular contract for data (Internet usage.) 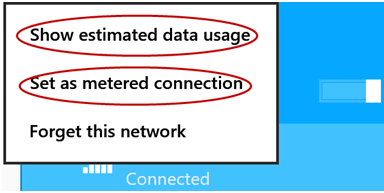 If your cellular contract has data limits, Windows 8 refers to it as a “Metered” connection. That means it is not free and usage needs to be watched. Everyone’s limits are different. You need to know what your cell provider contract specifies. Let’s say you have a 5 Gigabytes/month plan. If you download a 2 Gigabyte Windows update, and watch a 2 hour movie on Netflix, you’ve used up the majority of your plan – and you may only be 2 days into your month! If you go over your limits, there will probably be a charge. This also depends on your contract. Some mobile internet providers do not charge for overage, they throttle your connection, meaning they slow it way down. Other Wi-Fi connections, like a free RV Park Wi-Fi hotspot, or a home network, may be unlimited. That would be considered an UNmetered connection to the Internet. If you don’t see the taskbar, just move your mouse to the bottom of your screen and it will appear. Click on “Set as metered connection” and special rules will now apply when this connection is in use. Updates: While connected to a metered connection, Windows Update will only download priority updates, not all updates. Store: The Windows Store will pause downloading apps — including updates for apps. Start Screen: live tiles on your Start screen won’t update. OneDrive Synchronizing: You can choose to allow (or not) OneDrive to upload and download files while using a metered connection. 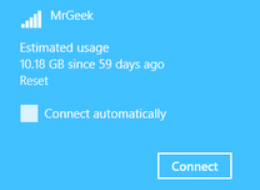 Open (or search for) your PC Settings->OneDrive->Metered Connections. If you use Internet while you travel there is a lot to know. If you like using public Wi-Fi hotspots and want to learn how to get better results, we recommend the booklet from our friends at TechnoRV titled: Guide to Boosting your RV’s WiFi. It’s a quick read with plenty of pictures. You will understand a lot more of what’s involved in connecting to a Wi-Fi hotspot so you can be an educated consumer. The booklet also details the 3 levels of solutions that TechnoRV sells. We know that they use everything they sell and they know what they’re talking about.